Neither Owlet Smart Sock 2 nor Baby Vida have been approved by the FDA. Parents are being cautioned against relying on monitors promising to accurately measure their baby's vital signs in an attempt to prevent Sudden Infant Death Syndrome (SIDS), in light of new research published in The Journal of the American Medical Association. The study, administered by Children’s Hospital of Philadelphia (CHOP) Research Institute, tested two smartphone-integrated consumer baby monitors: the Owlet Smart Sock 2 and the Baby Vida. Both use pulse oximetry which monitors the levels of oxygen in the blood as well as the heart rate. Dr. Christopher P. Bonafide, a pediatrician and researcher of the study, used the monitors on 30 infants ages 0-6 six months, who were hospitalized in general pediatrics and cardiology wards at CHOP. Bonafide told "Good Morning America" that he was "pretty shocked" by the results. "The two monitors used, looks on the outside was the same technology, but performed drastically differently," Bonafide explained. The Owlet Smart Sock 2, which is priced online at $299.99, performed "fairly well" in terms of pulse oximetry with some inconsistencies based on a hospital-grade monitor. According to Bonafide, the device would sometimes suggest that oxygen levels were low when they were actually normal. But, this monitor was more favorable than the Baby Vida in terms of measuring oxygen in the blood, he said. As for the Baby Vida, the device failed to accurately read heart rate and oxygen saturation. In many instances, the monitor would read that infants' heart rates were abnormally low when they were completely normal. In these cases, parents may bring their child to an unnecessary trip to the emergency room, Bonafide said. In terms of oxygen saturation, the monitor would suggest the opposite -- that the baby's oxygen levels were totally normal when in fact they were dangerously low. "Parents are buying these not just to tell them when things are OK, but to tell them when something is wrong," Bonafide said. "What we're showing is how these monitors are failing them to some degree." Bonafide also noted that parents should still let their pediatrician know if they're using these types of monitors. "Alarms will go off," he explained. "Those could be false alarms, they could be true alarms. It's important to have a conversation with the pediatrician to decide what to do when the alarms do go off." (Owlet Baby Care) The Owlet Smart Sock is pictured in an undated promotional image. In a response to CHOP's study, Kurt Workman, co-founder and CEO of Owlet said, "The accuracy and performance of the Owlet Smart Sock is something we take very seriously. Owlet's sensor accuracy was tested against arterial blood gas measurements in December 2017 and the sensor performed well within industry and regulatory standards for pulse oximetry..." Results of the brand's accuracy study is published here. "GMA" reached out to Baby Vida through Facebook, but they did not respond to a request for a comment. The company's website appears to be down and there is a limited stock of their device available for purchase on e-commerce sites. 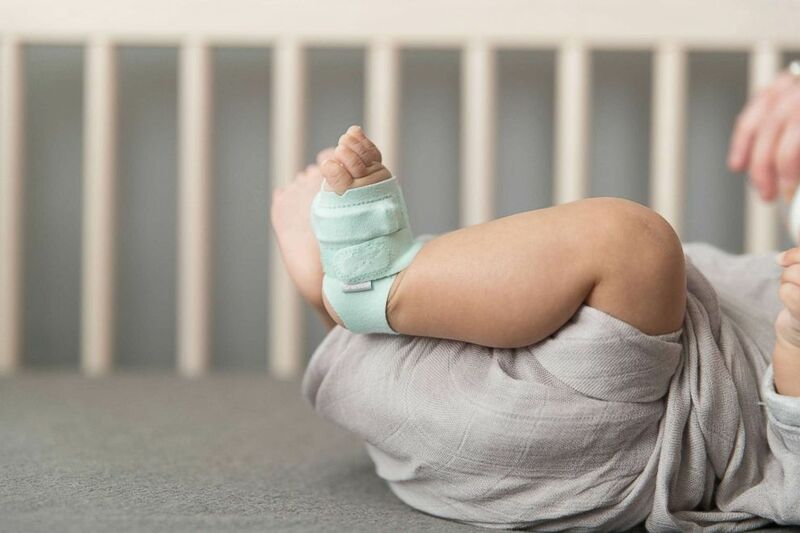 Both the Owlet Smart Sock 2 and Baby Vida have not been approved by the Food and Drug Administration (FDA), nor have they cleared or approved any baby product to prevent or reduce the risk of SIDS--the agency states on their website. In addition, American Academy of Pediatrics (AAP) advises against using home monitors and other devices that may be marketed to reduce the risk of SIDS. Dr. Angela Mattke, pediatrician at the Mayo Clinic Children's Center, told "GMA" that commercial devices as such could give families a false reassurance where they may not follow the precautions recommended by the AAP that do in fact reduce the risk of SIDS. 1- Place baby to sleep on their backs, on a firm surface. 2- Avoid use of soft bedding, pillows, crib bumpers or stuffed animals. 3- If you're getting sleepy or tired, put the baby down on the hard surface to avoid risk for injury or death. 4- Share a bedroom with parents, but no co-sleeping, preferably until the baby turns 1 but at least for the first six months. The APA says that room sharing decreases the risk of SIDS "by as much as 50 percent." 5- Avoid overheating. Mattke said your infant should need the same amount of clothing that you're wearing, and maybe one more layer to keep warm. 6- Avoid baby's exposure to smoke, alcohol and illicit drugs. 7- Follow the recommended immunization schedule, Mattke said.